Make things easy on Christmas day with our velvety, full-flavoured gravy. Handmade to chef Bob’s recipe using fresh organic chicken carcasses, it’s good and thick, with a sweet-sharp, richly chicken-y flavour and just the right scrunch of seasoning. Poured steaming hot over tender roast poultry and crunchy golden spuds… One of the year’s finest meals. Empty contents into a small saucepan and heat gently until simmering. Ensure it is piping hot before serving. Keep in the fridge and use by the date on label. Suitable for home freezing; if freezing, consume within 1 month. Defrost thoroughly before heating. 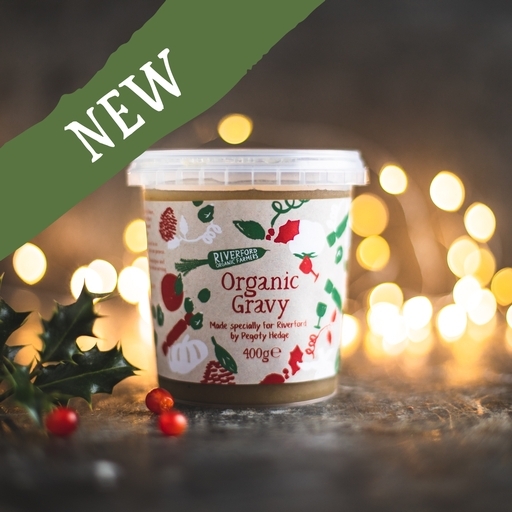 This Christmas gravy is made to our recipe by the good people at Pegoty Hedge, in their organic kitchen at the foot of the historic Malvern Hills, Worcestershire. The Surman family have been farming and cooking there for four generations, and their ethos is simple: if you use quality ingredients in the beginning and pay care and attention while cooking, you will produce consistently great tasting food. Chicken Stock (87.5%) (Water*, Chicken Bones (21%), Onion, Carrots, Celery, Sunflower Oil, Thyme, Bay Leaf, Black Peppercorns), White Wine, Cornflour, Dijon Mustard, Tamari Soy, Red Wine Vinegar, Salt*, Black Pepper.